Last month I had the pleasure of interviewing Marc Meyer a writer, martial artists and musician about his latest book Taichi: The Story of a Chinese Master in America . Marc’s novel tells the story of a man who leaves China in the early 1960’s to open a T’ai Chi school and reconnect with his Asian American family in Chinatown, New York City. The main character in the story was once the bodyguard of Mme Chiang Kai Shek. It’s bright red cover below spells out the words T’ai Chi Chuan in Chinese pictograms. And the novel is a must read for lovers of tai chi and Asian American fiction alike. It was inspired by the legendary T’ai Chi grandmaster Cheng Man-Ching and his American students during the period of the 1960’s in New York City. It tells of a time, years before the advent of Bruce Lee movies, when the Kung Fu art of T’ai Chi Chuan was first introduced into the United States and was secretly practiced only in small enclaves of America’s Chinatowns. Marc can you tell me little about your book? And some of the Characters in it? Allow me to reiterate my book is a work of fiction. As you are possibly aware, authenticity when it comes to T’ai Chi Chuan in and of itself is a murky business, due mainly to the fact that much of the teaching we have was passed down to us orally by it’s forebears. Very little about it was actually written down. Many of the forebears of T’ai Chi chuan were illiterate and its origins go back several thousand years. This makes the art form somewhat mysterious which is actually what I like about it. I’ve found Douglas Wyle’s books to be one of the more reliable sources of reference when it comes to the origins and practice of T’ai Chi Chuan, specifically Yang style which I practice and one that I draw upon recurrently in my book. Specifically on the subject of Yang style T’ai Chi which I’ve been practing and studying for the past 18 yrs. Let me stress that study and practice of T’ai Chi should occur simultaneously and continuously for the dedicated teacher. In the book, a T’ai Chi master named Kuo Yun San leaves mainland China in the 1960’s for what he thinks is the last time. His goals are simple, he envisions opening a successful T’ai Chi school and strengthening the bonds between himself and his Asian American family in Chinatown with whom he has had little to no communication in years. The results are surprising as Master Kuo finds himself trading one Cultural Revolution for another and his newfound friends and family members, thinking they were going to educate him into adopting an American lifestyle, find he has more to teach them. From some of the details in your book its obvious you have a solid martial arts background. Can you tell me about your own martial arts experience? I came to T’ai Chi Chuan through the back door in a sense. A dining club my girlfriend and I belonged to offered lessons in T’ai Chi on the beach where I live in Naples Florida as one of the perks of its membership. Fortunately for me, though I didn’t know it then, both instructors who taught this class had been students of Bob Amaker, a resident of Florida who co-authored books with Cheng Man-Ching. 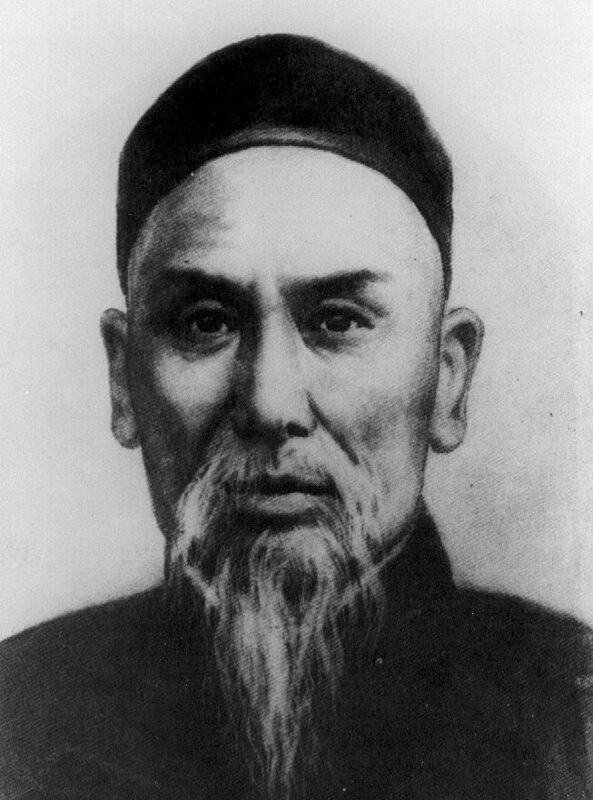 Cheng Man-Ching was one of the main proponents of Yang style T’ai Chi Chuan in this country. I subsequently went on to receive what’s known as form correction from Lawrence Galante, a student himself of four T’ai Chi Chuan grandmasters, Paul Guo, Yu Chen Hsiang, TsunTsai Liang and Chen Man-Ching. I received final instruction from a first generation student of Professor Cheng as he was called, from Maggie Newman, one of his last living pupils in 2006, then in her mid eighties. In your book you discuss the student teacher relationship. Can you tell us a bit more about where that inspiration came from? It’s my firm belief that every teacher involved with T’ai Chi has something to contribute to the student’s education, although many times the approaches can be radically different and often make a student doubtful about the quality of instruction that he or she is receiving. If you are getting instruction from someone in Taichi you’re unsure about, my advice is to be patient and hang in there. Looking back you may find what they had to teach gave you useful insight even if you didn’t think so at the time. For example one of my teachers had a very holistic and somewhat esoteric approach but I learned much from him about some of the more mystical aspects of T’ai Chi I might not otherwise have been privvy to. Another was very “nuts and bolts” about his approach but taught me the kind of accuracy that is absolutely essential for the study and practice of the art. I actually recommend that if you intend to take up T’ai Chi as a practice, that you go out of your way to learn from different teachers because you can often come away with a rounder and more beneficial education from doing so. Remember if you take up the practice of T’ai Chi you’re in it for the long haul. It can take up to a year to learn just one single form properly and up to ten years to learn it as an applicable martial art. “It’s all about the journey” sounds cliched but in the case of T’ai Chi it’s absolutely true and ongoing. You’re constantly perfecting and polishing that stone every day week, month and year of your life, which for me has turned out to be a blessing and one of it’s most cherished aspects. The book mentions a number of important martial arts milestones. Can you share a few of the most important ones? Another one of the more interesting perspectives of this fascinating, mystical and multi-faceted art is its tendency to tailor itself individually to the practitioner. For me it has offered something of use from a health standpoint at almost every age related juncture of my life since i began practicing it in my early forties. In my forties I struggled with the onset of tinnitus, a horrible and constant high pitched ringing in the ears. T’ai Chi helped to calm me down, calm my anxious feelings about it and sleep better. After I found I could sleep more easily, the problem didn’t seem to bother me so much during the day and has finally faded into the background to the point where I don’t even notice it anymore. Another more serious problem developed when I turned sixty called Neuropathy. Another constant painful nerve related chronic disease which had equilibrium problems as one of it’s symptoms. It has taken a full year but thanks in part to Taichi I have been able to manage my symptoms and get them under control. When the doctor later asked me if if I wanted to take a class in learning how to keep my balance to prevent myself from falling I was happy to tell her “I TEACH balance!”.T’ai Chi Chuan is literally the gift that keeps on giving. Finally, what’s next for Marc Meyer? Do you have other books in the pipeline? I have at least three more novels in me that I have begun working on simultaneously. One is a memoir, one is about an elderly batchelor who finds his way toward the end of his life and one is a young adult novel about five very unusual preteens in the possesion of individual healing powers. 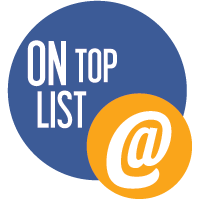 Of course getting ideas is easy, setting them down in a readable form that will capture an audience’s interest is very hard. You can find Marc’s book here by clicking the amazon link to the left. Any purchase you make via the affiliate link we will put back into www.StudyMartialArts.Org in order to help more students connect with genuine Master of Martial Arts. The idea of fajin is highly debated in Taijiquan circles, where some consider it the be all and end all of taiji quan skill, while others who have never experienced it, consider it a fallacy. In truth, fajin is a fundamental method of taijiquan. No matter what one might think or argue, the fact remains that fajin is a standard part of the tai chi chuan skill set and has been practiced and developed by tai chi masters since the founding of the art until present day. Below are excerpts from an article by Li Ya Xuan, one of the top students of Yang Jien Hou and Yang Chen Fu, on Yang family fajin. We can see examples of this correct fajin in the videos above as well as demonstrated by some present day teachers. Real taijiquan fajin is not lost. This article was written by Sifu Adam Mizner. This is the story of how three men from the US became seventh-generation disciples of Yang Lu Chan, the creator of Imperial Yang style of tai chi. On the 25th April and until to the 5 of May, Ray Abeyta and Wolf Carter from the Texas School of Tai Chi in El Paso and Michael Paler from Colorado Springs will on the invitation of Dr. John Fung, officially a sixth-generation disciple of Imperial Yang Style will visit Beijing, to spend 10 days learning from his kung fu sister Wei XiLan the daughter of the late GM Wei Shuren. These three men will become the first Americans to be included in this particular linage of tai chi. The story began when on the request of Ray Abeyta, Dr John Fung a 6th generation lineage holder of Imperial Yang living in Sydney Australia visited El Paso to teach a number of seminars. 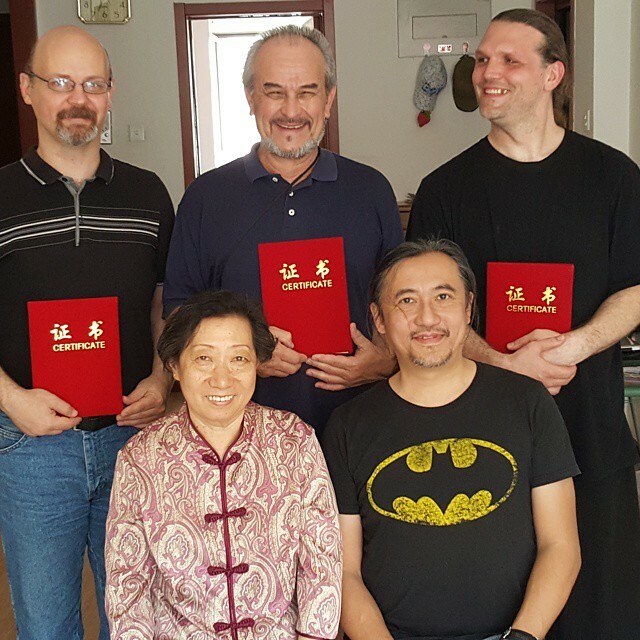 On seeing the dedication, skills, plus attitudes and personalities of Ray, Wolf and Michael as well as with much reflection Dr Fung decided to ask them if they would like to become disciples and join the Imperial tai chi family. Wei Shuren – Wang Yongquan – Yang Jianhou – Yang Luchan. This in itself is a huge deal for the tai chi community in the United States as Ray and his fellow tai chi brothers are all keen to return and share their knowledge with those who attend their classes as well as further afield. Knowing what I do of Ray I know this to be true as he is already sharing the information he’s learned from Dr. John Fung not only to the people in his existing classes in El Paso, but also to students in Santa Fe where he teaches every three months, and also with some people up in Colorado Springs. Anywhere people want to learn, Ray will share with them. Wei Xinlan daughter of the late GM Wei Shuren, Dr John Fung, 6th Generation Lineage holder, Sifu Wolf Carter, Sifu Ray Abeyta, Sifu Michael Paler, 7th Generation Lineage holders. Catching up with the group on my return to Beijing from Cebu I enjoyed listening to their stories and the whole groups enthusiasm for this rare art which is effectively what Bruce Frantzis calls Old Yang Style Taichi. An art that comes directly from Yang Lu Chan who was said to have only taught the emperor’s guard, the aristocracy and a select few disciples to a high level of excellence. The best of these students were his sons Yang Chien Hou, and Yang Pan Hou and Wu Chuan Yu from which Wu Style Taichi originates and which then subsequently led to the development of Sun Style Taichi. Over some delicious Yunnan food we discussed taichi and martial arts related topics. Listening to John Fung and Ray I was struck by their genuine openness, kindness, knowledge and of course passion to share this fascinating art. 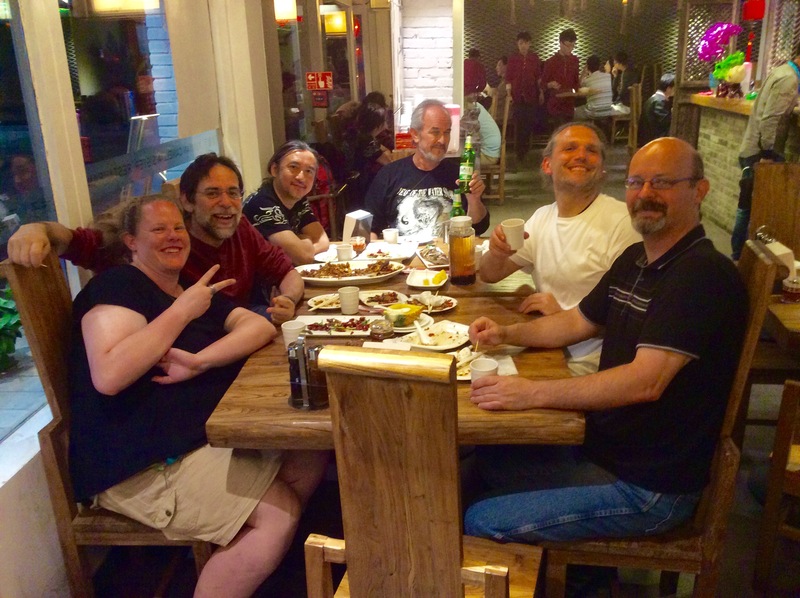 A delicious dinner of Yunnan food with my new friends, the day before they left Beijing. At http://www.studymartialarts.org we are keen to support those on their various epic martial arts journeys so please let us know if you have anything you would like to share.